In the last two decades, humanity has discovered thousands of extrasolar planetary systems. Recent studies of star- and planet-formation have shown that chemistry plays a pivotal role in both shaping these systems and delivering water and organic species to the surfaces of nascent terrestrial planets. Professor Geoffrey A. Blake in Chemistry at the California Institute of Technology talked to Duke faculty and students over late-afternoon pizza in the Physics building on the role of chemistry in star and planet formation and finding other Earth-like planets. The Milky Way rising above the Pacific Ocean and McKay Cove off the central California coast. In the late 18th century, French scholar Pierre-Simon Laplace analyzed what our solar system could tell us about the formation & evolution of planetary systems. Since then, scientists have used the combination our knowledge for small bodies like asteroids, large bodies such as planets, and studies of extrasolar planetary systems to figure out how solar systems and planets are formed. The “Astronomer’s periodic table,” showing the relative contents of the various elements present in stars like the sun. In 2015, Professor Blake and other researchers investigated more into ingredients in planets necessary for the development of life. Using the Earth and our solar system as the basis for their data, they explored the relative disposition of carbon and nitrogen in each stage of star and planet formation to learn more about core formation and atmospheric escape. Analyzing the carbon-silicon atomic ratio in planets and comets, Professor Blake discovered that rocky bodies in the solar system are generally carbon-poor. Since carbon is essential for our survival, however, Blake and his colleagues would like to determine the range of carbon content that terrestrial planets can have and still have active biosystem. Analysis of C/Si ratios in extraterrestrial bodies revealed low carbon content in the formation of Earth-like planets. With the Kepler mission, scientists have detected a variety of planetary objects in the universe. How many of these star-planet systems – based on measured distributions – have ‘solar system’ like outcomes? A “solar system” like planetary system has at least one Earth-like planet at approximately 1 astronomical unit (AU) from the star – where more ideal conditions for life can develop – and at least one ice giant or gas giant like Jupiter at 3-5 AU in order to keep away comets from the Earth-like planet. In our galaxy alone, there are around 100 billion stars and at least as many planets. For those stars similar to our sun, there exist over 4 million planetary systems similar to our solar system, with the closest Earth-like planet at least 20 light years away. With the rapid improvement of scientific knowledge and technology, Professor Blake estimates that we would be able to collect evidence within next 5-6 years of planets within 40-50 light years to determine if they have a habitable atmosphere. Graph displaying the locations of Earth-like planets found at 0.01-1 AU from a star, and Jupiter-like planets at 0.01-50 AU from a star. 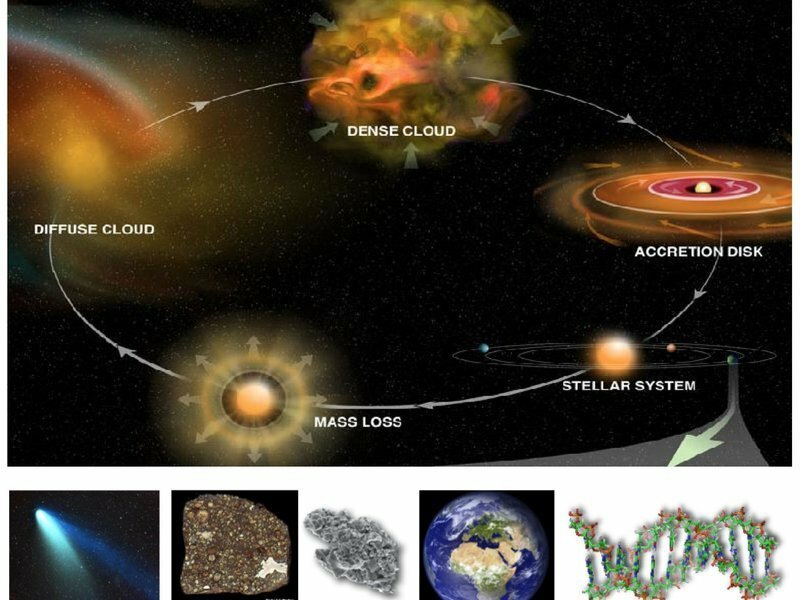 The Astrochemical Cycle: how solar systems are formed. Depiction of the snow line for planet formation. In our solar system, a process called dynamic reorganization is thought to have occurred that restructured the order of our planets, putting Uranus before Neptune. This means that if other solar systems did not undergo such dynamic reorganization at an early point in formation of solar system, then other Earths may have lower organic and water content than our Earth. In that case, what constraints do we need to apply to determine if a water/organic delivery mechanism exists for exo-Earths? Although we do not currently have the scientific knowledge to answer this, with ALMA and the next generation of optical/IR telescopes, we will be able image the birth of solar systems directly and better understand how our universe came to be. Professor Blake and the team of former and current Caltech researchers. Learn more about the Blake research group or their work.